The Education Connection (TEC) received an Ohio School Board Association award for 2018. 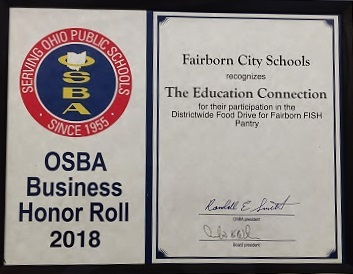 TEC received an OSBA Business Honor Roll 2018 from Fairborn City Schools for The Education Connection's participation in the District Food Drive 2018. The goal was to raise 20,000 pounds of food for the Fairborn Fish Pantry. The entire staff of The Education Connection committed to help in this project where Douglas Fritz, President, helped load food on to the trucks for the community. The Education Connection also donated over 400 pounds of food to the drive in our effort to support Fairborn. The award was received by Eric Piper, Vice President, at the May 4, 2018 Fairborn School Board along with five other business that received awards for their work with the schools. Mr. Piper received the award from the School Board members and Mr. Mark North, Superintendent, and said, "It was an honor and privilege to be a part of such a worthy school project." Fairborn City School's has been an important customer of TEC for many years and works continually to support the children and families in Fairborn.